"We estimate that using Iron Speed Designer saved at least $1 million in project costs." The Integrated Systems Management (ISM) application was developed for the US Coast Guard, whose primary contractor was ITT Corporation. Light Speed Solutions worked as a sub-contractor for the design and development of ISM. 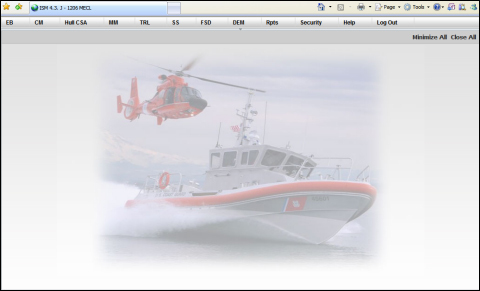 The US Coast Guard needed a system to document and track all actions for their 180 Response Boat Medium (RB-M) boats (www.responseboatproject.net). 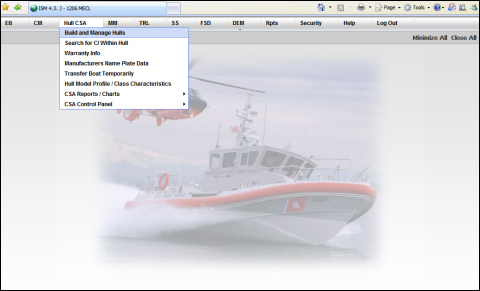 Integrated Systems Management application was a new application that completely integrated all functions required to track the entire lifecycle of a US Coast Guard boat. The system tracks the components and any variances from the engineering baseline during initial manufacturing through regularly scheduled maintenance and other corrective actions, parts inventory, and ordering from various vendors. The application also maintains all technical reference manuals required to maintain and repair each boat. Prior to the ISM application, this entire process was performed by disparate non-integrated systems. The Integrated Systems Management application utilizes a centralized database, so it was important to design a web-based application. ISM is used exclusively by members of the US Coast Guard at various locations. Coast Guard employees at various levels, including ship personnel, quartermasters, supply clerks and harbor personnel, all have jobs to perform using the system. Engineering Baseline — Each boat that is built has an engineering baseline established. Every component of the ship is documented as a "configuration item" and includes maintenance information and associated parts schema. Change Management — The change management system documents variances that are requested during the boat building process. Workflow items are generated to take each change request through the review and approval process, including procuring financing once the change is approved. All approved change requests are retained since they are deviations from the predefined engineering baseline. Hull Information — This sub-system documents the physical layout of a specific boat and what is called the "Manufacturers Nameplate Data". Serial numbers for each component are recorded and retained along with warranty information. Once the boat is launched, this sub-system also keeps track of total days the boat is in service, as well as the number of "engine hours". Maintenance — The maintenance sub-system keeps track of all scheduled maintenance (based on boat usage), corrective actions (based on reported problems), and maintenance work orders that are required to bring the boat up to engineering baseline specifications. Every work order must be tracked from initiation to completion. This includes the actions taken at each step of the process and the type and hours of workforce required for each step of the process, as well as inventory items and tools required to perform each task. Orders — The order sub-system keeps an inventory of supplies for maintenance. Based on the boat's profile, the maintenance sub-system creates a list of supplies needed for a time period relative to standard maintenance requirements. This function is especially important when a boat is transferred from one station to another. Technical Reference Library — This sub-system keeps track of all technical reference material for every type of boat. The library can be searched by hull, by type of boat, by type of work order, etc., to ensure the most current reference material is available. Supply Store — The supply store sub-system tracks warranty claims against manufacturers after a failure. The vendors' receiving process for fulfillment of supply orders is also tracked. 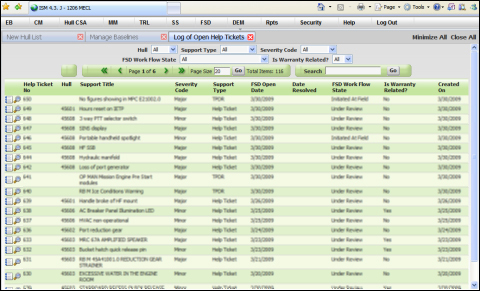 Field Support Desk — This sub-system creates help tickets for problem reporting and creates the process flow for a help desk ticket. Quality Control — The QC sub-system tracks all the distinct use cases within the ISM system and allows each release of the software to be tested. Personnel can test each use case and document whether the software version supports each requirement. In addition to all of the above, the ISM application has integrated security, supports multiple languages, can integrate with a report writer for ad hoc reports, supports interaction with E-Commerce web sites for parts ordering, is Web Services enabled with over 50 published web services, and provides for automated email notifications. In order to use the real estate more effectively, we designed the Tab System which was security enabled to only show users the options permitted based on their security role. Using Tabs also allowed us to load only partial data to speed up the load times. For example, if a page has ten tabs, using DHTML based tab system would have slowed the site, which usually loads the data for all the tabs. The system is used differently by various Coast Guard personnel based on their jobs and the current disposition of the boat they are working with. Different sub-systems must be used based on what stage the boat is in: manufacturing, user acceptance, normal usage, or undergoing major repairs. The Integrated Systems Management application accesses one Microsoft SQL Server, 250 database tables with 150 database views, and around 2,000 web pages. The largest database table is the Maintenance table, which contains about 1 million rows of code. The application currently has around 100 users who support 13 boats. Once all 180 boats are in service, we anticipate the total number of users will increase to around 1,000. Currently, the ISM application processes more than 500,000 transactions per month. The project was implemented over a three-year period. The design was complex and constantly being changed due to monthly Critical Design Reviews. When the application was demonstrated during these review sessions, changes invariably arose, some of which were so significant as to require a complete redesign and rewrite. This type of Agile Development would not be possible without using Iron Speed Designer to build the application. The project team was six people at its largest, but was usually sized at four team members. The application development took less than two years to complete. We had to write many code customizations for successful implementation of the application — about 35,000 to 50,000 lines of code. As multiple developers were working on the application, we tried to create Code Customization Templates. These templates were available through code customizations to allow us to implement them in a consistent manner across the board. This is the main portal page a user would see after login. There are various sub-systems that can be extended for their individual menus by hovering on their labels. Much of the customization was possible due to the architecture of Iron Speed Designer, which allowed us to modify the Base Classes and Base Application Pages to streamline all the changes. 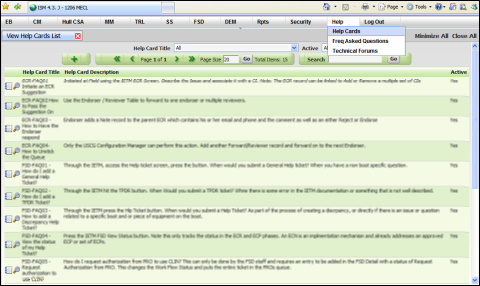 We did use third-party controls in the application, including extensive use of Telerik controls and Crystal Reports. The initial infrastructure build took approximately three months. After that, we used Code Customization Templates to write all our routine code. Integrated Help System is a hit as it allows the users to know more about the system with online help available for each screen. Help Cards and Frequently Asked Questions are maintained by the ISM core group based on questions asked by the users during their operations. We made several page layout customizations to implement an application-specific design theme. In order to allow easier navigation between systems, each major section starts a new subsection like tabs in Internet Explorer. This allows the user to move from one page to the other rapidly. The other option which users have reverted to in the past was to open multiple instances of the application. However, it is cumbersome to work with multiple windows as compared to multiple tabs. The data was not retrieved again if the user went back to a tab. In addition, the view state is maintained and takes the user back to the same place they had been when working on a specific section. This application would have taken more than five years to develop without Iron Speed Designer due to the constant changes in requirements and the need to recreate the application with dramatic database changes. Another benefit to using Iron Speed Designer for development was that each of the sub-systems was developed as a separate application for demonstration and testing purposes and only integrated together at the end when all the functionality had been approved. This would not have been possible using a standard development methodology. We estimate that using Iron Speed Designer saved at least $1 million in project costs. In addition the project would have required a much larger development team, as well as taking more than five years to complete. The project would have been feasible without Iron Speed Designer, but with significantly greater effort and cost. We are currently using the framework developed during this application for more enterprise class development. Much design and development went into the framework so that it could be scaled to support 5,000 users with adequate performance in a distributed environment. The lessons learned in how to architect the user interface, business logic and database access layers are currently being used for high-performance large-scale application development. This application will be scaled gradually to more than 1,000 users once all 180 boats have been manufactured and brought into service. There are no plans to add additional web sites. Akesh is co-founder of Light Speed Solutions and ExecuTrain of Long Island. He is passionate about technology and loves to share his knowledge with others. ExecuTrain of Long Island is a corporate training company specializing in bringing real-world knowledge to the training room. Light Speed Solutions is a professional consulting and software development company that focuses on turning business vision into reality. Akesh Gupta has more than 14 years of experience in architecting, designing and developing successful applications. Light Speed Solutions has become a one-stop solutions center offering advanced, diversified expertise in all facets of development, with complementary expertise in systems, reporting and accounting. Akesh holds a Master of Sciences degree from Northwestern University.